I've become somewhat of a "gamer" over the recent span of time. But as a cat-loving gamer, of course that means I'm always on the lookout for games that have even the slightest reference to cats. Playing as the one and only LaserCat, the 8-bit style exploration platformer is simple, yet incredibly well done. Most gamers can probably play completely through in a couple hours and they'll finish the game just wanting more (Surprise! This sequel also exists). LaserCat's sole mission is to save his BFF Owlfriend, who's been kidnapped by evil Wizzord the magical space frog. To get to Owlfriend and save him, LaserCat must travel through more than 200 rooms in Wizzord's castle, collecting keys to unlock Owl's cell. Each time LaserCat finds a key, the player first must answer a riddle/trivia question before they're able to collect it. As expected, the maze-like fortress is also rife with monsters and traps. After rescuing Owl, our cat hero takes on evil Wizzord [potential SPOILER] to serve due justice. LaserCat, released in 2012 by Monster Jail Games, is available for Xbox and PC, but it's a little tricky to find since the indie game isn't available on Steam. 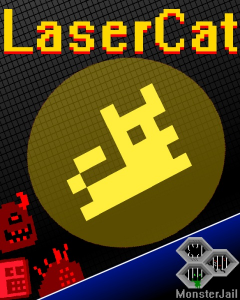 Download LaserCat at IndieCity for $1.99. A simple, quick play, LaserCat is appropriate for young kids to adults, who'll love its silly trivia and retro art-style throwback to the early days of gaming.